In its third year, the Aurora Prize for Awakening Humanity has received 750 submissions for 509 unique candidates. Baixar Ficheiro Completo O que é isto? During the nomination period which opened the day after the 2017 prize was announced, and closed September 8, entries were submitted in 12 languages from 115 countries including USA, Russia, Egypt, Armenia, India, Germany, UK, Pakistan, Ukraine, and Kenya. This represents a 100% increase from last year when 254 candidates were presented in 13 languages from 66 countries. 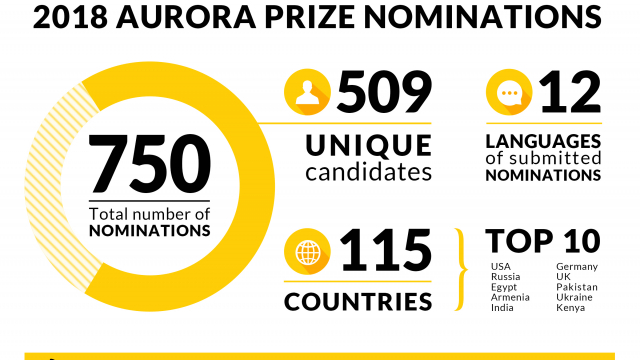 The profiles of the candidates for the 2018 Aurora Prize will be sent to the group of humanitarians invited by the Aurora Initiative will carefully assess the veracity of the submissions, the degree to which they satisfy the criteria of demonstrated courage, commitment and impact on preserving human life. The shortlist of candidates will be sent to the Selection Committee chaired by Academy Award-winning actor and humanitarian George Clooney. “At a time of pressing global humanitarian crises, it is great that we have the opportunity to recognize and thank individuals who do good for the sake of doing good. Each year’s Aurora nominees have inspired us all with their work and their words. We look forward to learning about new heroes from around the world,” said Mary Robinson, member of the Aurora Prize Selection Committee, former president of Ireland and former UN High Commissioner for Human Rights. The Selection Committee includes Nobel Laureates Oscar Arias, Shirin Ebadi and Leymah Gbowee; former president of Ireland Mary Robinson; human rights activist Hina Jilani; former foreign minister of Australia and President Emeritus of the International Crisis Group Gareth Evans; former president of Mexico, Ernesto Zedillo; Director of the Institute of Global Health Innovation at Imperial College London Professor the Lord Darzi of Denham; president of the Carnegie Corporation of New York, Vartan Gregorian. The 2017 Aurora Prize was awarded to Dr. Tom Catena, a Catholic missionary from Amsterdam, New York, who has saved thousands of lives as the sole surgeon permanently based in Sudan’s war-ravaged Nuba Mountains where humanitarian aid is restricted. Marguerite Barankitse was awarded the inaugural Aurora Prize in 2016 for her tireless commitment to restoring children’s dignity and hope as the founder of Maison Shalom and the REMA Hospital in Burundi. The finalists of the 2018 Aurora Prize will be announced on April 24, 2018, the annual day of remembrance of the Armenian Genocide. The $1 million Aurora Prize, established on behalf of the survivors of the Armenian Genocide and in gratitude to their saviors, will be awarded for the third time on June 10, 2018 in Armenia. The laureate is invited to share $1million with organizations which inspire their work. The award ceremony is a culmination of the weekend of special events that will take place on June 8-10, 2018. Pre-eminent humanitarians, academics, philanthropists, human rights defenders, elected officials, journalists and business leaders from around the world will gather for the purpose of galvanizing action to address today’s most pressing humanitarian challenges and to celebrate the best of humanity.